TSKgel SuperMultiporePW columns are packed with particles containing a wide range of pore sizes. The innovative multi-pore particle synthesis technology, which Tosoh scientists pioneered, creates a linear calibration curve within each particle, resulting in better accuracy for molar mass determination. Three semi-micro TSKgel SuperMultiporePW columns varying in linear range are available within this series, enabling high speed and high resolution analysis of water-soluble polymers with lowered solvent consumption. The base material of each TSKgel SuperMultiporePW column is polymethacrylate. A wide molecular mass range can be analyzed with the three different TSKgel SuperMultiporePW columns, from high molecular mass water-soluble polymers to oligomers. The packing material in the TSKgel SuperMultiporePW columns is more hydrophilic than that of TSKgel PWXL series columns, which further reduces the chance of adsorption of hydrophilic polymers. 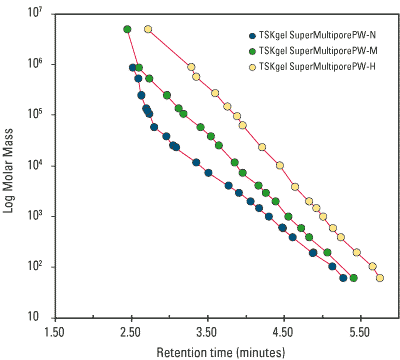 The calibration curves for polyethylene glycol, oxide and ethylene glycol are shown below for each of the three TSKgel SuperMultiporePW columns.